Alain Badiou’s magnum opus Being and Event opens with the claim that ‘mathematics is ontology’. Much of his philosophical work from the 1980’s until today consists of a profound reexamination of the conceptual field of classical philosophical ontology with the aid of contemporary mathematics. This conference is prompted by the perception that the first generation of thinkers reacting to Badiou too often did not adequately come to terms with the mathematical substance of this work. If on the one hand, contemporary mathematicians only rarely intervene in the field of continental philosophy, philosophers, on the other hand, often lack the advanced mathematical education that would enable them to grasp the full scope of Badiou’s thought. This conference, organized together with Alain Badiou himself, intends to fill this gap in the reception of Badiou’s philosophy. If Spinoza already claimed that mathematics is what permits the human being to think beyond the final causes of Aristotle and if Jacques Lacan spoke about the matheme as capturing the “impasse of the real”, Badiou set out to restore the very relationship of philosophy and mathematics itself. In Being and Event, he based his understanding of Being on the premises of set theory, the inexistence of the One, and the existence of the generic set. In Number and Numbers, Badiou defied the dominance of a reductive numerical convention in contemporary capitalism by claiming that “numbers are a form of Being”. And in Logics of Worlds, Badiou based his understanding of what there is on contemporary logic(s). Finally, the soon-to-be-published Immanence of Truths will address the contemporary mathematics of the higher infinite. Clearly, contemporary mathematics has been a constant companion to Badiou, and it would be difficult if not impossible to understand the core of his thought without understanding the dialogue that he has established with mathematics. 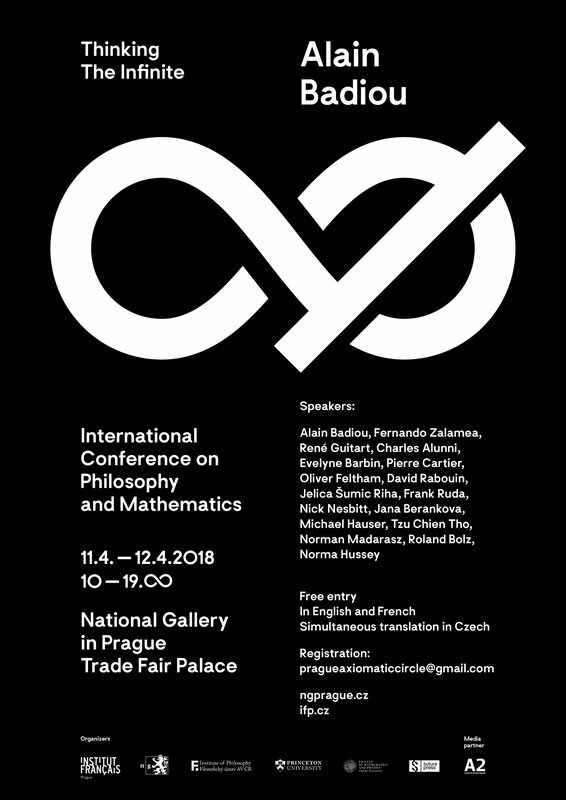 The conference Alain Badiou: Thinking the Infinite intends to unite mathematicians and philosophers eager to engage with Badiou’s ontological and mathematical postulates. 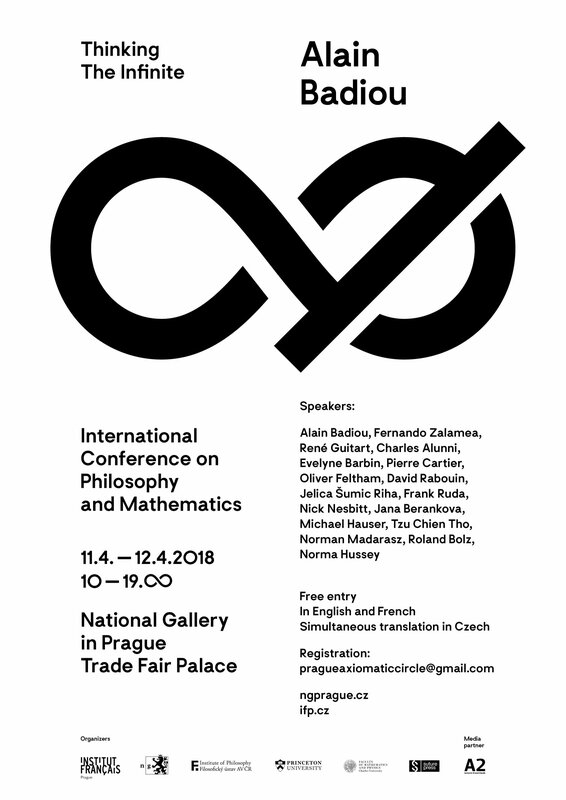 The conference will include a keynote lecture by Alain Badiou, in which he will demonstrate the logical necessity of grasping Being through mathematics. It will also include a series of roundtables, whose goal will be to create a dialogue between mathematicians and philosophers. Is the identification of ontology with mathematics more than a simple philosophical extravagance? Why has physics been sutured of necessity to mathematics? And how can we define the relationship between mathematics and philosophy today? Pierre Cartier, Is History of Mathematics a Part of a General History? Tzu Chien Tho, Sets, structures and Sizes: Mathematical Ontology Revisited. Oliver Feltham, Writing Multiplicity: One or Several Ontologies? Norma Hussey, A New Hope; for the Subject and for the Symbolic. Roland Bolz, Mathematics is Ontology? Reflections on Badiou's use of Set Theory in Being and Event. Michael Hauser, Ontological Limits of Mathematics. Nick Nesbitt, From Logic to Axiomatics: Badiou, Cavaillès, and the Critique of Frege. Frank Ruda, The Frege-Frage, or: The Stakes of the Void. Jelica Sumic Riha, Le dire de Cantor, selon Badiou et Lacan. SETS AND / OR CATEGORIES? Norman Madarasz, Beyond Recognition: Badiou’s Mathematics of Bodily Generation. Charles Alunni, Relation-objet et onto-logie. Ensembles ou catégories. Fernando Zalamea, Prendre sérieusement pour la philosophie Paul Cohen et Alexander Grothendieck : le pendule analyse/synthèse, ensembles/catégories, dans L’être et l’événement et la Logique des mondes. René Guitart, Univers algébriques et dualités, pour la dialectique matérialiste de Badiou. Alain Badiou, La différence philosophique entre la théorie des ensembles et la théorie des catégories.